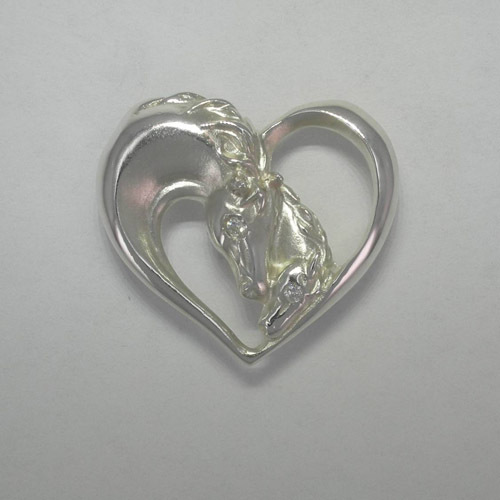 Desc: Sterling Silver brooch/pendant in the shape of a heart with a mare nuzzling her foal in the center. There are diamonds in the eyes of each horse. The Sterling Silver has three different textures for depth and detail, bright polish, satin finish, and textured. The pin/pendant weighs 7.50 grams or 4.81 dwt. 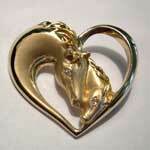 We have this brooch/pendant in 14 karat yellow gold, see SK240.